Once again allowed to use the Sequential name, Dave Smith’s latest instrument is a tribute to a genuinely classic synthesizer. Before the launch of the Prophet 6, DSI had already resurrected the Prophet name twice. The first time was for the Prophet 08, which married DCOs and an analogue signal path to digital contour generators and modulators, and this was generally well received. The second was for the much more powerful Prophet 12, but some analogue purists, many of whom I’m fairly sure had never played one, objected to its SHARC-powered digital oscillators. But by the time that 2014 rolled around, the people at DSI had long been considering building a VCO/VCF/VCA polysynth. Then, when Ikutaro Kakehashi of Roland Corporation suggested to Yamaha that they return the Sequential Circuits name to Dave Smith, and Yamaha generously did so, the idea became too strong to resist. First things first. The Prophet 6 is, as its name implies, a six-voice polysynth. It offers two VCOs per voice, but these are not recreations of the Prophet 5’s oscillators, which offered simultaneous ramp and pulse/PWM waves on Osc1, and simultaneous ramp, triangle and pulse/PWM waves on Osc2. In contrast, you can obtain just a single waveform per oscillator on the Prophet 6, although this is continuously variable from triangle, through ramp and then to pulse-wave shapes. As on the Prophet 5, you can sync Osc1 to Osc2, and Osc2 offers detune, a low-frequency option, and a switch to disconnect it from the keyboard. There’s also a knob called Slop that adds some inconsistency — up to a maximum of around ±1 semitone — to the tuning of the oscillators. This is genuine drift that changes as you hold a note and not, as you find on some digital synths, a random pitch variation applied as each note is played. Quite right too! But you have to wonder why genuine VCOs require something to ‘damage’ their performance; I suppose that it says a lot about how far tuning stability has progressed in the past 50 years. But whatever the underlying technology may be, it would be churlish to criticise the manufacturer for offering us the choice of tight tuning or whatever degree of vintage drift we might want for a sound, especially since this is programmable on a patch-by-patch basis. Next in the signal path lies the Mixer, which, in addition to the outputs from the two oscillators and the digitally generated white noise generator, adds a knob to control the level of a triangle wave sub-oscillator one octave below Osc1. Sine waves ‘subs’ can be too limited and square waves can be too bright, so the choice of a triangle wave is a good one. A Prophet 5 voice contained a 24dB/oct low-pass filter, with controls for cutoff frequency, emphasis, keyboard tracking on/off, and (positive only) amount for its dedicated ADSR contour generator. In contrast, a Prophet 6 voice has two filters: a 12dB/oct high-pass filter and a 24dB/oct low-pass filter, each with cutoff frequency, resonance (emphasis), contour amount and keyboard tracking controls. However, while there’s only a single, digitally generated, filter contour per voice, you can apply its output independently to each filter in negative as well as positive fashion, and key tracking is available for each at 50 percent as well as zero percent (off) and 100 percent (on) amounts. You can also control the contour amount (but not the cutoff frequency itself) using velocity, and this can be set on or off independently for each filter. The final stage in the Prophet 5’s signal path was a VCA controlled by a second ADSR contour generator. This is recreated on the Prophet 6, but again with the addition of velocity control of the contour amount if selected. This means that notes can be louder when you play harder, but neither longer nor shorter. The Prophet 6’s rear panel.The modulation capabilities of the Prophet 5 have acquired near mythical status over the years but, in a world where modulation matrices offer dozens of routes for hundreds of sources and destinations, their reputation is perhaps exaggerated. Mind you, it was wonderful stuff in 1978. Poly-Mod acted on a ‘per note’ basis and allowed you to direct the outputs of the filter contour generator and Osc2 to any combination of the frequency and pulse width of Osc1, and filter cutoff frequency. It doesn’t sound like much, but it was a quick, simple and affordable way to obtain all manner of swept and cross-modulated sounds that would not otherwise have been possible. Beneath this, the LFO and Wheel-Mod sections (sometimes referred to as Mono-Mod because a single modulator acted upon the sound as a whole) allowed you to apply an LFO to the frequencies and pulse widths of the two oscillators, and to the filter’s cutoff frequency. You could also replace the LFO wave with noise if desired, or mix between the two. The modulation capabilities of the Prophet 6 step some distance beyond this. For example, the Poly-Mod section now allows you to apply the sources in positive or negative fashion, and it offers five destinations instead of three — the extra ones being oscillator 1’s waveshape and the cutoff frequency of the high-pass filter. Likewise, the Prophet 6’s LFO modulation capabilities lie in the realm of ‘vintage plus’, with six waveforms (including S&H) rather than four, and seven destinations rather than five. However, you can no longer modulate the pulse widths of the oscillators independently — both are now ‘on’ or ‘off’ simultaneously, which is a shame. Interestingly, the digitally generated LFO now strays well into audio frequencies, which means that you can obtain AM and FM effects from it. Unfortunately, there’s no way to make it track the keyboard and you can’t modulate it, so the range of such effects is quite limited. But on a more positive note, the LFO section now offers Initial Amount. In the past, you had to practice leaving the modulation wheel a tiny bit above zero to obtain things such as gentle vibrato or chorusing, but this is no longer necessary, which is a much bigger deal than you might imagine. 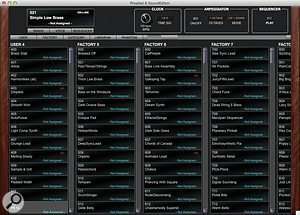 The whole of the synth’s voice structure is laid out clearly on a single page within the SoundTower editor, making the Prophet 6 much simpler to understand and edit than more complex synthesizers that require multi-page editors.The onboard arpeggiator has a tempo range of 30 to 250 bpm and offers timing divisions from bpm/2 to bpm x 8. Its range is up to three octaves, you can latch it using the synth’s Hold function, and there are five modes: up, down, up/down, random, and ‘in the order that the keys were pressed’. Alongside this, there’s a 64-step, single-channel step sequencer that allows you to record up to six notes per step. It’s incredibly basic, offering just rests and ties in addition to notes, and there’s no real-time recording capability and you can’t even transpose it during playback! But programming it couldn’t be simpler: you press the record button and play notes or chords, and add the rests or ties where desired. If you then save the Program that was selected when you programmed the sequence, the two are saved as a composite. You can’t use the arpeggiator and the sequencer simultaneously but, if you’ve left some notes unallocated, you can play along with the latter. But be aware that neither the arpeggiator nor the sequencer transmits its output via MIDI, which might frustrate some users. The Prophet 5 lacked effects but, in contrast, the Prophet 6 has quite a few of them. First in the chain comes an analogue distortion unit. Depending upon the level of the input signal and how far you crank up the distortion, you can obtain anything from mild overdrive to full-blooded grunge from this. Twin 24-bit digital effects units then provide the rest of the effects. At this point, I can hear purists tearing up their copies of Sound On Sound and racing for the nearest source of hard liquor, but I wish that they wouldn’t. Quite apart from the damage to their livers, it’s unnecessary because the effects are in a side-chain, and the original signal always remains in the analogue domain, whether you add effects or not. The Sequencer editor page allows you to see and edit a Prophet 6 sequence — something that’s not possible on the synthesizer itself.Using the effects is much like hanging two stomp boxes off the back of the synth. Unit A offers mock-BBD (analogue) and digital delays, plus a chorus and two phasers. Following this, unit B offers the same selection plus four reverbs: hall, room, plate and spring. Each unit supports just one effect at a time and, once you’ve selected the one you want, you can adjust its two (!) parameters. If you think that that’s primitive, you’re right, but stomp boxes were what we used to make synths sound interesting in the 1970s, and internal stomp boxes (albeit of far higher fidelity) is what we have here. The only drawback is that the effects on/off switch turns both units on and off simultaneously. Individual switches would have been better. As you would expect, the Prophet 5’s portamento is retained but, instead of just a rate knob, it now offers four modes: fixed rate and fixed time, each with legato modes, which is nice. Likewise, unison is also retained. On the original, this couldn’t help but create enormous sounds because no two of the 10 oscillators were ever perfectly in tune with one another. On the Prophet 6, you’re given control over the number of voices in the unison stack and the amount of detuning between them, as well as your choice of low-, high- or last-note priority, each with single- and multi-triggering options, all of which turns it into a superb monosynth. You can also use Unison as a chord memory and, if you save the patch containing the chord, this too is saved. Unlike the Prophet 5, the new model allows you to spread your playing across the stereo field to create a more expansive sound. It does so by directing alternate voices to the left or the right by an amount determined by the Pan control, and by turning the effects into their stereo versions, such as ping-pong delays. But, for purists, there’s a Mono option that defeats the pan setting and any stereo information created by the effects. Finally, there are two volume controls, one that allows you to set the level of the patch you’re editing and the other to determine the overall loudness of the synth. For the past few years, Dave Smith and I have gone through a bit of a ritual when we meet. After the usual greetings, I’ve asked him when he’s going to fix my Rev 1 Prophet 5, and he has told me to get lost. But, earlier this year, David Croft at the Synthesiser Service Centre repaired it for me instead, making it possible for me to subject the Prophet 6 to the toughest test of all. Most, if not all, polysynths make their excuses when placed next to the wonderful Rev 1, and slink off home for their tea. But the Prophet 6 didn’t look fazed. In fact, I could almost see it bearing its tattoos and snarling, “bring it on!”. To begin, I followed the manual’s suggestion of calibrating the Prophet 6’s oscillators and filters. I then tried to play the self-oscillating low-pass filters as conventional oscillators. Their pitches weren’t the same and the tracking was still less than perfect, so I ran the calibration routines again... and again, but I could never get the filters close enough to play them as I would on, say, a Roland Juno. So I tried the same on my Prophet 5, and obtained the same result. In fact, the similarity of the resulting sounds and the range of tracking and pitch errors were uncanny. Nonetheless, knowing that even minute differences between low-pass filters are critical for some enthusiasts, I performed some further tests to try to trip up the Prophet 6. For example, using a ramp wave generated by Osc1 and a very rapid downward filter sweep, I compared the synths at various amounts of resonance, and across a wide range of pitches. I was amazed to find that, with careful tweaking, the differences could lie between small and unimportant. This was a very good beginning. Keeping track of everything while moving patches around on the Prophet 6 itself is fraught with danger — it’s very easy to overwrite an important sound and lose it forever. The Banks pages make it quick to see and simple to organise all of your sounds for set lists and other projects.Moving on, I programmed some brass sounds on each synth. At first, it seemed that the Prophet 5 was more ‘edgy’ than the Prophet 6, but a few moments spent tweaking the filter settings and the levels in the signal path soon sorted this out. 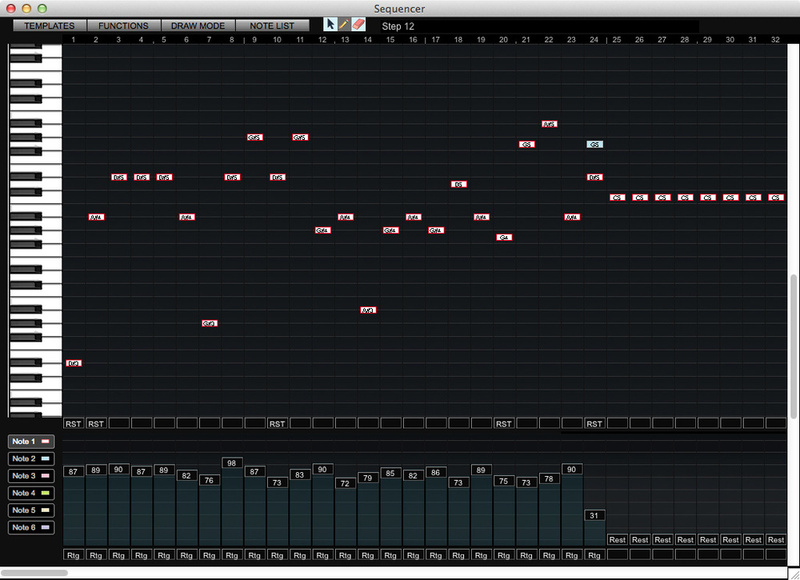 With Osc2 adding vibrato via the Poly-Mod section, and the LFO adding the ‘rip’, the results were beautiful. In truth, I could always tell which synth was which — not because the sound was better on one than on the other (whatever that means in this context), but because the Prophet 6 tended to be more consistent from note to note. If you’d ever tried recording using a 37-year-old Rev 1, you’d view this as a good thing! Next, I set up identical sync sounds on both synths. The only noticeable difference between them was caused by the slightly different shapes of the filter contours sweeping the pitch of Osc1. (The Prophet 6’s contour generator sounds roughly exponential and is a little smoother than the Prophet 5’s, which curtails more abruptly.) Does this matter? Not a bit. It you want to use sync to tear the heads off of the front rows of your audience, the Prophet 6 will do it every bit as nastily as the Prophet 5. The Prophet 6 offers 1000 patch memories and, although 500 of these are permanent ‘factory’ sounds, the other 500, which you can overwrite, are duplicates of these so you lose nothing by saving your own creations. Interestingly, 40 of the factory sounds are emulations of the original Prophet 5 presets, and I was excited to compare these until I realised that they had been overwritten decades ago and I had no way of reloading them. So I turned the test on its head by selecting the sounds on the new synth and trying to recreate them on the old one. This not only turned out to be possible, but it sometimes took me no more than a couple of minutes to make the two sound almost identical. On other occasions, it was necessary to read the parameter values off the editor (see box) and then tweak them, but it would have been churlish to criticise either synth for the differences. It was becoming clear that, within sensible limits, the Prophet 6 was doing the job of the most revered of all Prophet 5s! What’s more, it was doing it without requiring retuning every few minutes, without mis-triggering, without a 1970s halo of background hiss, and without the annoying noise generated by the substantial fan mounted on the underside of the Rev 1. Having proved that the Prophet 6 could fulfil my historical needs, I next decided to create some sounds that no vintage Prophet could attempt. First, I set up a suitable single-oscillator lead sound with about a quarter-tone of slop, then applied bucketloads of the onboard spring reverb effect. Next I added portamento, and then selected unison while playing a chord in the shape V-I-IV so that I had a somewhat unpredictable three-osc synth playing an inverted major fourth under each note. Why? Because this is the lead sound for Tarkus. It doesn’t matter whether you approve of my choice of inspiration or not; this is a Moog Modular patch that no Prophet 5 could produce, yet the Prophet 6 does it with ease. At the other end of the spectrum, I used the high-pass filter to create delicate sounds not obtainable from a Prophet 5, and then moved on to a range of band-pass-filtered sounds reminiscent of some other manufacturers’ synths of the era. I also caused the signal to clip and, using analogue distortion plus chorus and reverb from the onboard effects units, transported myself back to Dave Stewart’s wonderful synthesised guitar solos on his albums with Barbara Gaskin. Finally, I experimented with the synchronisation of the LFO, the arpeggiator, the sequencer, and the delay effects (both to each other and to MIDI Clock), and discovered all manner of interesting sounds that no polysynth could have attempted in the late 1970s. With a shorter keyboard, the Prophet 6 is smaller overall than its forebear. 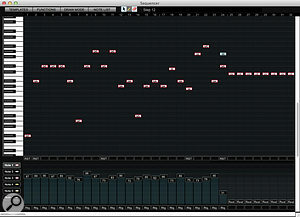 Before finishing, I have to offer special mention to the Prophet 6’s velocity sensitivity and aftertouch. The only one of the early Prophets that offered these was the T8, and this never quite achieved the status of the Prophet 5 due to (real or imaginary) shortcomings in its sound. So what we have here is a Prophet that can sound like the cr me de la cr me, but which offers both velocity sensitivity and aftertouch that you can direct to the frequencies of oscillators 1 and 2, the LFO amount, the loudness, and the cutoff frequencies of the LP and HP filters. Sure, the amount you specify is applied equally to all the selected destinations, but I don’t mind — it’s very similar to the Pressure Mod section of the T8 and, since I often have no other way to modify the sound when performing live, the presence or omission of aftertouch can be a deal-breaker when evaluating any new keyboard. Unfortunately, the T8’s ability to control the LFO rate using aftertouch has been lost, which is a shame. So... everything is great, yes? No. For me, there’s one, huge problem with the Prophet 6. The Prophet 5 had a five-octave keyboard. The Prophet 600 had a five-octave keyboard. The Prophet 10 had two five-octave keyboards. The Prophet 08 had a five-octave keyboard. The Prophet 12 still has a five-octave keyboard. So why does the Prophet 6 have a four-octave keyboard? Sure, I understand how synths are often used nowadays, and no doubt many players will praise its compact size, but if I have something that looks like a Prophet and sounds like a Prophet, I want to be able to play it like a Prophet. I’m sure that others will feel the same so, despite the slightly higher cost, I exhort the company to bring out a five-octave version for those of us who still use both hands. Inevitably, the Prophet 6’s nucleus of 12 VCOs and 12 VCFs has set the hearts of many vintage synth enthusiasts aflutter. This isn’t without good reason. It’s incredibly reminiscent of the original Prophet 5, albeit one viewed through the wrong end of a telescope, but there’s a lot more here than the vintage synth redesigned using surface-mount technology. The high-pass filter, effects, velocity-sensitivity and aftertouch, arpeggiator, step sequencer, and a comprehensive MIDI specification transform it into a much more powerful beastie that still retains the soul of the original synth. The manufacturer has described it as ‘Vintage with a modern twist’, but I would extend this to ‘Vintage with a modern twist that also includes smooth potentiometers, a new keybed, accurate tracking over a wide range, the ability to stay in tune, and a warranty’. Of course, there’s a lot that the Prophet 6 doesn’t offer, and I have heard people ask for facilities such as programmable contour shapes, modulatable LFOs, and much more. But that’s the province of the Prophet 12, not the Prophet 6, whose underlying concept is rooted in simplicity and immediacy. Indeed, if you’re interested in a polysynth with zillions of voicing facilities and much more advanced versions of things such as arpeggiators, sequencers and effects, you shouldn’t have read this far unless you were looking for a little light reading in the smallest room. But if you’re after a traditional synthesizer that can cover monosynth and polysynth duties with equal aplomb, that can be creamy smooth or send your neighbours’ dogs rushing indoors with a headache, and can do it all in a way that is classic not just because it’s old, but because the company got it right the first time, you cannot ignore the Prophet 6. You may not be able to afford one, but you’re going to want one. If it weren’t for that damned keyboard! The Prophet 6 has no menus, just selections for global functions that tailor it to your needs. These include facilities such as velocity and pressure-sensitivity curves, global tuning, transposition, encoder modes and local on/off. Then there are settings for things such as the MIDI channel, MIDI clock transmit/receive, and whether MIDI CCs or NRPNs are used to transmit and receive parameter values and controller messages. In an era of multi-tiered menus and 400-page manuals, it’s all wonderfully simple. By definition, analogue purists would want the whole of the Prophet 6 to be analogue, but that probably isn’t practical. So, what about its digitally generated ADSR contours and its digitally generated LFO — do they detract from the sound? To be fair, the early Prophets that used this architecture — the 600 and T8 — didn’t offer the snappiest contours ever heard, but that was more than 30 years ago. Those generated within the Prophet 6 are so rapid that you need to slow them down to eliminate the Attack and Release clicks (unless you want them, of course). Then there’s the question of sonic uniformity; to some people’s ears, digital contours and digital LFOs applied to digital oscillators and digital filters can sound too rigid and sterile. But the outputs from the contour generators and the LFO in the Prophet 6 are converted to CVs and applied using VCAs, which no doubt adds a tiny bit of variation to each note. In my view, it would be hard to argue that the Prophet 6 is diminished by its digital bits. To the far right of the Prophet 6’s rear panel (as you look at it) you’ll find stereo audio outputs together with the headphones output, all using unbalanced quarter-inch sockets. On a synth of this quality, I would have liked to have seen balanced outputs, but it’s not a big deal. To the left of these, you’ll find TRS pedal inputs for volume and the low-pass filter cutoff frequency, plus a third for a standard sustain pedal. Next comes the Footswitch/Sequence socket. In its simplest mode, this allows you to start and stop the sequencer or arpeggiator using a footswitch. Alternatively, you can inject a suitable audio signal from, say, a drum machine, and a Trigger extractor will cause the synth to play a sequence one step at a time. A third mode generates Gates from the external audio signal, and you can use these to turn the sequencer or arpeggiator on and off, and to gate the VCF and VCA contour generators. The fourth mode acts as both Trigger and Gate extractor, and combines the actions of the second and third. The manual suggests that, for best results, you should ‘use a loud signal with a sharp attack/decay and little or no sustain’. In other words, a clock pulse! So don’t inject your favourite bit of prog rock and expect the Prophet 6 to extract two bars of 7/8 followed by two bars of 4/4 and then a chorus in 9/8. It just wouldn’t be fair. Finally, there’s MIDI In/Out/Thru provided on five-pin DIN connectors, and MIDI In/Out on USB. The only other hole in the back is an IEC mains socket. The internal power supply is universal, accepting 100-240V and 50/60Hz mains. Bravo! The Prophet 6 has a comprehensive MIDI specification, with many if not all of its parameters and controllers capable or sending and receiving MIDI CCs and NRPNs. An extensive editor from SoundTower takes full advantage of this and, while I could find no manual for it at the time of the review, I’m confident that most users will be comfortable with it. 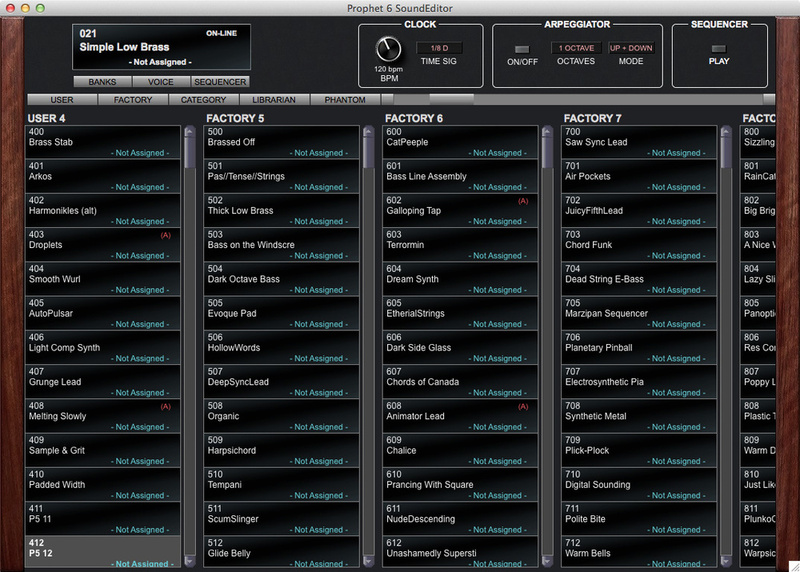 There are three main blocks of pages in the editor, and these are called Banks, Voice and Sequencer. The first is a patch manager and librarian. The second reveals the complete voicing structure of the Prophet 6 on a single page, making it very simple and intuitive to edit the synth. The third provides access to the sequencer. Less obvious, perhaps, are the Program Genetics page (which creates a ‘child’ patch from two ‘parent’ patches using mixing, morphing, mutating and randomising techniques) and the Patch Maker, which allows you to build new sounds from pre-defined elements such as oscillator section settings, filter section settings, effects section settings, and so on. 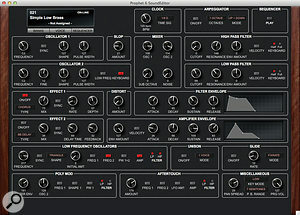 I found the voice editor to be by far the most intuitive and useful page but, were I ever to take a Prophet 6 on the road, the librarian would then become very important, making it possible for me to organise my sounds for gig lists and even allowing me to save and reload complete memory dumps for separate projects. (Without the editor, the Prophet 6 allows you to dump and reload patches individually, in groups of 10, in complete banks, or in total, but patches are always reloaded to the same locations from which they were saved, which means that important new sounds could easily be lost.) I doubt that I would ever use the sequencer pages to any great extent, and I have never been a big fan of serendipitous sound design using morphers and randomisers, but I can see that others might enjoy these hugely. Type Six-voice polysynth with analogue signal path. Keyboard 49-note semi-weighted, with velocity sensitivity and aftertouch. Velocity sensitivity Applied to VCF and VCA contour amounts. Oscillators Two VCOs per voice, with Osc1 sub-oscillator, PWM, waveshaping and sync, plus noise. Filters One 12dB/oct resonant HPF, one 24dB/oct resonant (self-oscillating) LPF. Contour generators One bi-polar filter ADSR, one amplifier ADSR. Poly-Mod Two sources, five destinations. LFO-Mod Five waveshapes, six destinations, with initial amount and clock sync. 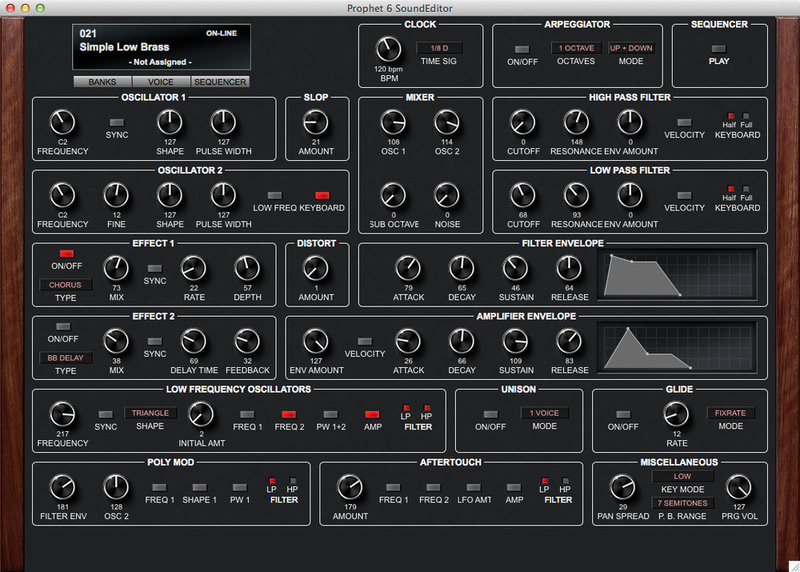 Effects Distortion plus two 24-bit digital effects units (delays with clock sync). Other Unison, portamento, chord memory. Arpeggiator Five modes (Up, Down, Up/Down, random, as played), three-octave range, clock sync. Sequencer One channel, 64 steps, six-note polyphony, with ties and rests. Memories 1000 (500 fixed, 500 programmable). Physical 813 x 323 x 117 mm, 9.5kg. The Prophet 6 offers 16 alternative tunings, including reasonably well-known alternatives such as Meantone, Pythagorean C, Just Major, Just Minor, and Arabic 12-Tone. There are also some lesser-known tunings including Wendy Carlos’s 12-tone gamelan scale, 1/4 Tone, 19 Tone, 31 Tone and others. Experimenting with these is fascinating and, if you want to try other scales, the manual suggests that these may be available as SysEx files on the Internet. However, there’s no way to create alternative tunings on the synth itself. It looks like a Prophet. It feels like a Prophet. It sounds like a Prophet. Bloody ‘eck Doris! It is a Prophet. I cannot fathom why they stuck a four-octave keyboard on it. Almost everything is right about the Prophet 6. It looks and sounds beautiful, and the user interface is clear and easy to use, inviting you to experiment and play. If you can live with its shortened keyboard, it has to be number one on your list of analogue synths to audition. Dave Smith Instruments +1 415 830 6393.